This really is a work of art and I love seeing the water behind your card. Grand! Wow - this is just fabulous - love the layout. The sea certainly looks choppier than normal - but still better than over here where the wind is finally dying down. Maybe you'd like to pop up the coast again in July when we'll be in Fuengirola for a holiday with our daughter and her family! I love this Silvie. Your colours are fabulous and I love the contrast between light and dark. 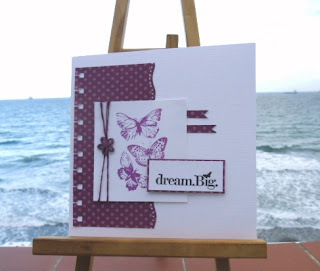 Lovely card with a lot of texture. This is just stunning Sylvie! :) Really beautiful! Gorgeous card sweetie love the image & the lush purple colour. Hi Sylvie, happy new year to you, I don;t think Ive; said it to you! Your card is, as always, a stunner, I love it! This is beautiful Sylvie the design, colour and the image is super and what a gorgeous background that water looks so inviting. Sylvie...this is beautiful!! Love all the wonderful details...so very pretty!! I think we used the same punch on our cards! LOL! Love the design of this...and it's fabulously purple!